Congratulations - You've decided to get married and you'll want everything to be just as you have always dreamed it would be. It's the most magical day of your life and, for your wedding or reception, you need a beautiful venue, with excellent food, discreet and caring service, and an ideal Cotswolds setting for photographs to treasure. Our recommended hotels make for great wedding venues. Romantic, rural locations are perfect for the most memorable of weddings, and wedding guests who come a long way love the opportunity to visit the Cotswolds! Manor House Hotel at Moreton-in-Marsh is an elegant and enchanting 16th century Cotswold retreat where you can revel in luxury, indulge yourself with fine food and drink and relax in a homely and friendly atmosphere. It’s a place where you can feel at home, make friends and enjoy the finer things in life. Each of the rooms has a unique character of its own, with distinctive décor and fine views. 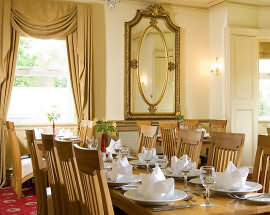 Celebrate the style and sophistication of a classic English wedding at the Manor House Hotel. Your guests will be captivated by this elegant Cotswold manor. Our wedding co-ordinator will be delighted to work with you to ensure that your special day is as individual as you are. If you wish, you can even have exclusive use of the whole venue for your big day. Our romantic rooms are licensed to hold civil wedding ceremonies and we can accommodate up to 135 wedding guests, an ideal venue for your wedding reception and to entertain your family and friends. 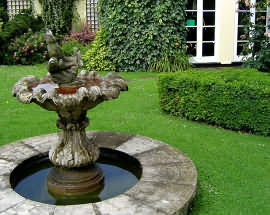 Please telephone the Manor House Hotel on 01608 650 501 for your complimentary wedding Brochure or for more details. Our stunning new thatch-roofed timber Breeze House for an alfresco style ceremony complete with Red Carpet. Please call Tom Gibbons on 01608 650 501 for more information. We’re just going to put it out there: Foxhill Manor may well be the Cotswolds’ most impressive place to tie the knot. When you celebrate your marriage here you get the whole manor to play with. Eight beautiful bedrooms at your disposal, including three spacious suites, a bar and lounge, private grounds with jaw-dropping views and a stunning Ballroom for the ceremony and wedding breakfast. The Ballroom comes with a glorious wooden floor, a huge feature fireplace, a twin set of striking chandeliers, hand-painted walls and lashings of light, courtesy of triple aspect windows and a snazzy central skylight, the stage is set for an unforgettable ceremony. The Ballroom has space for up to 70 guests, and opens directly onto the terrace and the gardens, offering breathtaking views of the Vale of Evesham beyond. ...... and you don’t want a wedding-by-numbers. At Foxhill, because every couple is unique, every wedding is too (although admittedly, they do all have that whole ‘unforgettable party on a fabulous country estate’ element in common). When you celebrate your marriage here you get the whole manor to play with, including the beautiful Ballroom (ideal for ‘I do’-ing, dining and dancing), eight fantastic bedrooms (with more available at Dormy House and on Farncombe Estate), and gorgeous, valley-view grounds with tons of marquee space. Plus, of course, Foxhill’s team of dedicated staff on hand to make every wedding dream a reality – no matter how outlandish. The Cheltenham Regency Hotel is situated 2 miles from the beautiful Cheltenham town and only a short distance from the M5 motorway. From planning menus, drinks packages and canapés to advising on our local contacts for photographers and discos, our weddings coordinator is here to help. This wedding brochure covers only some of the many possibilities the Cheltenham Regency Hotel can offer as a wedding venue. At the Cheltenham Regency Hotel we have two wedding venues where you can hold your wedding ceremony. 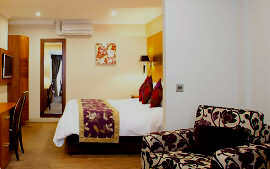 The Hayden Suite for up to 140 and the Regency room for up to 70. The hotel is licensed to hold civil weddings and partnership ceremonies 7 days a week. 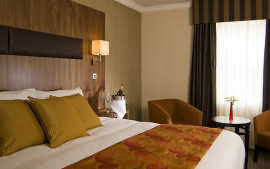 With ample free parking, free WiFi and a dedicated team of friendly, experienced and enthusiastic staff, The Cheltenham Regency Hotel offers a stress free environment for all your requirements. Please contact us with your enquiries and Book Online from our website.